It’s been quite a while since we last heard of the Britannic duo EBONILLUMINI, now expanded to a trio with the addition of a drummer made from flesh. Nearly four years to be correct. After their debut demo The Ebon Channel the Monk (J.D. Tait) and the Maiden (Christina Poupoutsi) went into a hiatus, to emerge when the stars seemed right, that is now. 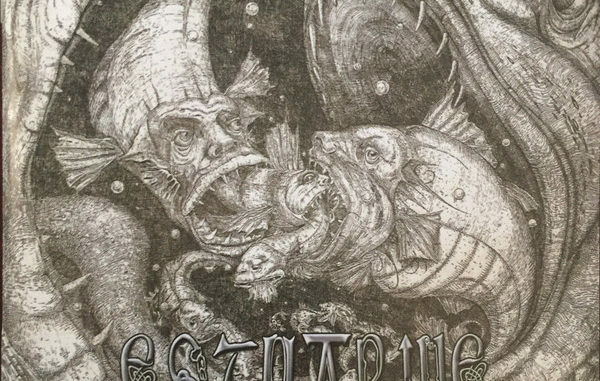 This EP, Estuarine, which is a split with Tait’s other project WORMS OF SABNOCK, continues to develop the conceptual basis of The Ebon Channel; a geographical exploration of the Ebon Atoll, part of the Marshall Islands in the Pacific Ocean. As some of you might remember, I wrote a highly favourable of the first demo, which you should read here before continuing. Upon revisiting The Ebon Channel, I can conclude that it is indeed one of the more inspiring, fascinating and unique demos I have heard, though the intoxicating spell it lured me into has slightly faded. Or rather, I’ve grown numb to its allure. Unfortunately, that impression spills over to the new release. Structurally, it follows the same pattern as its predecessor: four tracks, of which one is a shorter experimental interlude, and musically it carries the same singular torch through the oceanside gloom. 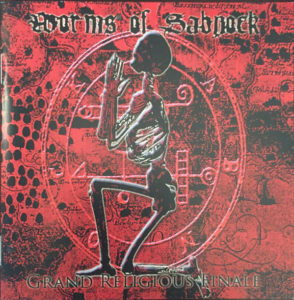 Quite operatic, ambitious gothic metal interspersed with bewildering experiments, bursts of scorching black metal, superbly theatrical dynamics, and most of all dazzling and haunting melodies. Back to back with The Ebon Channel, it’s not just a logical continuation but a collection of songs that, besides a slight change of sound and the addition of drummer the Mantodea (André Kjelbergvik Thung), could follow as the second side of an LP. The atmosphere and melodical sensibility is more or less intact – only a bit less interesting, I’m afraid. The four pieces are thematically connected to the elements – instead of fire we have “Danger”, but that’s not necessarily illogical. And indeed, “Water” and “Air” do relate musically to the separate elements; the slow and relentless push and pull of the ocean waves and the cascades filling a sinking ship on the one hand, the majestically soaring clouds and impulsive playing winds on the other. “Land”, the interlude, has sampled spoken words in Norwegian and a saxophone. Don’t know what that means but it deepens the experimental side of EBONILLUMINI. The more metallic bits are the weakest links. Tait’s screams simply do not work for me, and the atmosphere and soft beauty of for example the ballad “Water” is simply washed away. Perhaps an unusual comment for a metal publication, but what I would beg of EBONILLUMINI is to be less metal. At least less extreme. Somehow it sounds more like something that should have been released in the late 90’s (and shunned for its more left-field ambitions) – bands like Dismal Euphony comes to mind, as does Devil Doll and not the least Korova’s pop album “Dead like an Angel”. The Victorian atmosphere should also allure certain fans of A FOREST OF STARS and CODE, though the musical resemblance to those peeps might be a bit arbitrary. There is nothing wrong with these four tracks; it’s simply that I was expecting more. However, the promo indicates that they are to release a proper album later this year, as soon as the programmed drums have been recorded properly. I am quite looking forward to finally hearing EBONILLUMINI with a proper production, letting their ideas be spread out and bloom. I am sure it will be worth the wait. As mentioned this is a split album. WORMS OF SABNOCK is a new name to me, besides their relations to THE MEADS OF ASPHODEL. Currently in hiatus, this might be the last ever release of theirs, and since these six tracks were recorded from 2007 to 2009, you probably shouldn’t expect anything more from them. So what is this? Melodic full-on blasting black metal presenting “a message of atheism” and “raising the awareness of England’s false democracy” – that is, a political band rather than satanic. Could be a breath of fresh air but it’s hard to tell without the lyrics. Honestly, this EP does very little to entice me. Like EBONILLUMINI, it feels like this sound and style belongs more to the late 90’s than today, but unlike the previous band the Worms hardly add anything that I haven’t heard before. The inclusion of violin and flutes to “Nature’s Whore” is quite pretty – kudos to the member Isis whose semi-operatic vocals also enhance the experience – as are the sections with acoustic guitars, but the main vocal performance ruin it (Tait again); they sound… commercial, in lack of better terms. Fans of early ABIGOR, DISSECTION and similar champions of melodicism might want to check this out, and anyone into THE MEADS OF ASPHODEL, but I can’t force myself to care about it. Also, the production is tinny and flat. Britain simply isn’t a good black metal country. Too bad.